The manufacturing environment can be hard on equipment, and pumps are no exception. This was the scenario at a custom metal manufacturing facility in the Northeast where the pumps were repeatedly failing. 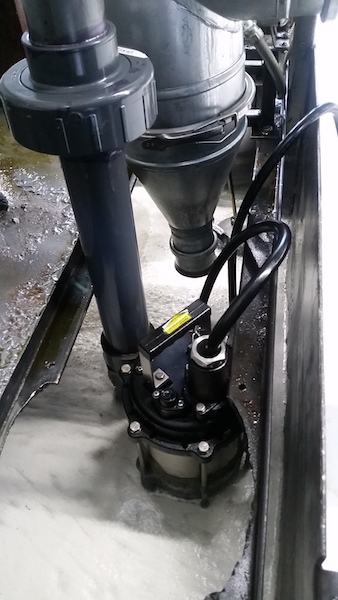 After numerous work stoppages and costly replacement expenditures, the manufacturer finally turned to Midway Industrial Supply for help finding a solids handling pump solution to the ongoing problem. Midway Senior Account Manager Lenny Klein was tasked with finding a solution. Klein took it upon himself to gain a full overview of the problem — how many gallons per minute were moving through the nearly continuously running pumps, how many feet of head needed to be pumped, and the piping configuration, before recommending a BJM SK Series Submersible Shredder Pump. The manufacturing process in this facility primarily involves metal tooling and grinding, which in turn result in a lot of metal shavings. The process also uses machine coolant to lubricate and cool the tooling and metal during the manufacturing process. The coolant, metal shavings, and inevitable trash and other debris eventually find their way into the sump where the pumps had been failing. In this particular application not only do the pumps need to be able to handle the metal and other debris, but they have to be powerful enough to pump the coolant through the paper filter media back to a tank for reuse. The previous pumps had not been able to handle the suction and discharge required without getting fouled. The SK Series is a line of electric submersible pumps with shredder action impellers designed for use in municipal, industrial, and agricultural waste water installations. Model SK37C was recommended for this particular installation and can handle up to 1.6-in. solids at 360 gal per minute and a maximum of 62 ft of head. BJM’s shredder pumps leave solids slightly larger than if passed through a grinder pump. The shredding action is caused by using a cutting impeller with a Tungsten carbide tip, against a "spiral" shaped diffuser plate. Klein also recommended a seal minder kit for the client to place in the control panel. The seal minders send a signal from the pump to the control panel in the event there’s a breach in the double-mechanical seal allowing water to enter the seal chamber. The 304 stainless steel motor housing helps protect the pumps from abrasion and premature wear caused by harsh environments. The motor is protected by double mechanical seals. The lower seal is made of silicon carbide/silicon carbide, and the upper seal is made of carbon/ceramic. In addition, a lip seal has been installed above the impeller that helps prevent abrasives, such as sand, from entering the seal chamber. Winding protection and NEMA Class F motor insulation allow the motor temperature to rise to 230°F. An automatic switch turns the pump motor off if the temperature and/or amp draw gets too high. When the motor cools the switch will automatically reset and the pump will restart. A hardened cast iron stands up to rough handling and pumping of water containing abrasives unlike pumps with soft resin impellers or plastic exterior components. Specifications are dependent on the model and may change without notice. The pumps are also available in 316 cast stainless steel, and an explosion proof shredder pump is also available. The SK Series Shredder Pumps have virtually eliminated the previous fouling problems, saving the manufacturer significant time and money. It isn’t difficult to see how failed equipment can quickly have a negative impact on a company’s bottom line. Klein said the end user was so pleased it purchased several additional BJM pumps to have on stand-by in the event anything goes wrong with another pump. Klein said he would recommend the BJM submersible shredder pump for any process in which debris falls into and must be pumped out of a sump. “I have a huge amount of confidence in these pumps. They do what they’re supposed to do,” he said.